“Keep left, keep left!” I anxiously reminded my husband. I held on tight and peered through the front window of our rental car as he navigated the highways out of London and northwest toward our destination, the beautiful Cotswolds region of England. My husband has had lots of experience driving on the left in other less populated parts of the world, but this afternoon was a challenge as the traffic was heavy and we were joining throngs of Londoners headed out of town on a three day bank holiday. “Here comes another roundabout – take the fourth exit, here’s one…that’s two…three…THAT WAY!” Accompanied by lots of pointing, wild gestures and my hair standing on end, my spirited navigation may have been more unnerving than helpful, but after a while we were out of town and I was marveling at the scenes unfolding before us. I stared dreamy-eyed at the lush countryside of the Cotswolds, sighing, “I feel like we are in a fairy tale land!” All around us were vibrant green rolling hills, flower fields, sheep grazing, and quaint little thatch-roofed houses with lilac blooming along the walls. We passed through delightful boroughs seemingly locked in time, each with its own iconic stone church perched along a winding road. If you picture the Shire from the Hobbit, you can picture the Cotswolds region – it is rural England at its most charming. For our Cotswolds home-away-from-home, we’ve chosen the highly rated 5 star guest house, Staddlestones Bed & Breakfast in Chipping Campden. After four non-stop days in London, we were looking forward to some relaxation in the peaceful English countryside. We were welcomed by our hosts Steve and Pauline Kirton, and they instantly made us feel like friends as well as valued guests. Sitting down to a cozy afternoon tea featuring Pauline’s home baked mini iced cakes and scones, I felt the adrenaline of the afternoon drive fade away and I settled into the lovely quietude of this place. This is the perfect guest house. 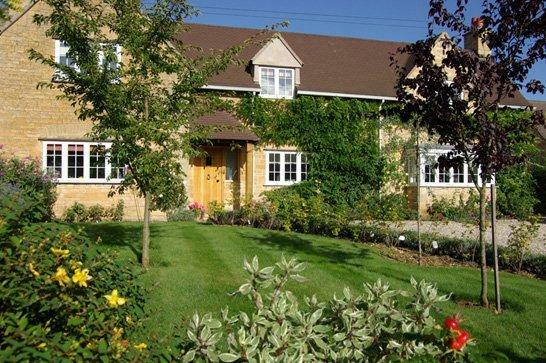 A traditional but modern home, Staddlestones is family owned and operated and enjoys a location in the heart of the Cotswolds. The best features are a spacious living room and dining room in which guests can gather and chat in front of the massive stone fireplace. The upstairs of the main house features two ensuite guest rooms. We stayed in the Garden Room which is detached from the house and scenically situated beyond the home’s back garden. Up the wooden stairs to our cottage, we found a comfortable sitting area furnished with a leather sofa, bookshelves, a flat screen TV and a hospitality corner complete with refrigerator, a basket of English biscuits and candies, china mugs and everything we needed to make a cup of tea. 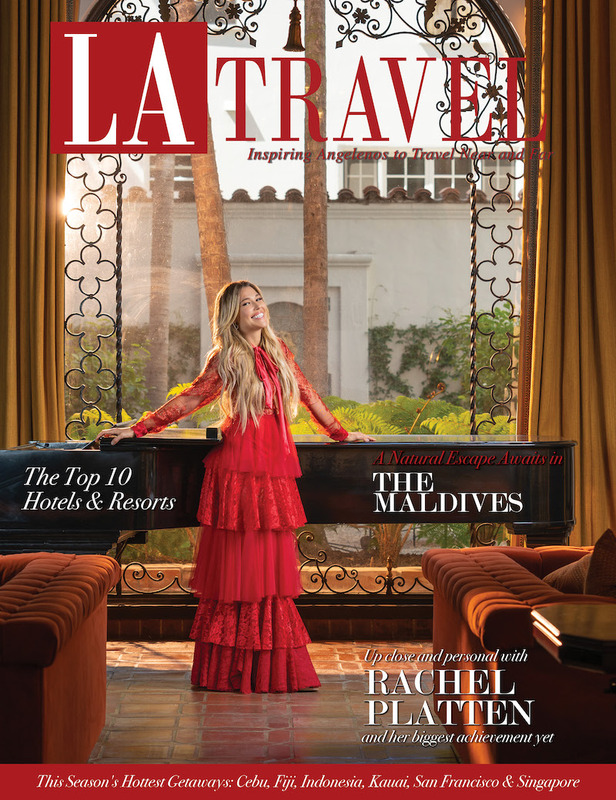 The apartment carries out the décor of the main house with warm honey-toned wooden floors, vaulted ceilings, poppy and gold bed coverings and rich, heavy draperies tied with golden cords. The ensuite bathroom is ultra modern and features heated racks for the fluffy white towels and yummy designer amenities. Steve and Pauline have truly considered every little detail for our comfort. There is lots of privacy and quiet here, and the sweeping pastoral view out the sitting room window is guaranteed to calm even the most harried traveler. 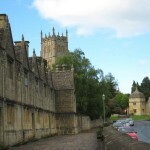 Staddlestones is located a short walk from picturesque Chipping Campden. At twilight, we sauntered down the grassy lane toward town. 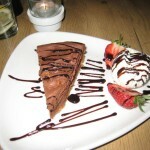 Steve had given us the run-down on places to eat, and having skipped lunch, we were on a mission to find a special meal on our first night in Chipping Campden. There were a surprising number of gourmet options in this little village, and we chose Joel’s because of the delicious aromas wafting out to the street from its kitchen. An intimate establishment located in a vintage brick house in the town centre; Joel’s cuisine is decidedly French/Continental. The restaurant is famous for its mouth-watering steaks, so after appetizers of Escargot baked in Garlic Butter and a Garden Fresh Tomato and Artichoke Salad, we ordered Fillet Steak au Poivre, a traditional Peppered Fillet steak with a Creamed Brandy Sauce, as well as Fillet of Pork Normande, served with an Apple, Calvados, Mushroom & Cream Sauce. With every item we ordered, our waiter responded with the quintessential British affirmation, “Oh yes, lovely!” Indeed, the food was just “lovely” and this place definitely lives up to its reputation! 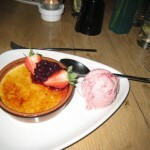 Just when we thought we couldn’t hold one more bite, along came the dessert tray and we succumbed to not one, but two desserts – a Chocolate Mousse Fresh Strawberries and Cream, and a Crème Brulee with Strawberry Ice Cream. A walk back through town was in order after such a sumptuous meal, and we passed by houses with thatched roofs and wisteria-covered walls and old shops, churches and homes all built in the signature golden Cotswold stone. It’s a good thing we had that walk, because after a heavenly night’s sleep in the solitude of Staddlestones, it was time to eat again – and we wouldn’t want to miss breakfast in the main house! Steve seated us at the large round dining table, brought us a pot of coffee, and invited us to enjoy the bountiful buffet while Pauline cooked our breakfast to order. At the buffet, we chose from fresh fruit, cereals, yoghurts, a wonderful curried homemade fruit compote, produce fresh from the garden, jams and marmalade. Pauline, who Steve has nicknamed the “Mrs. Patmore” of the house, was busy in the kitchen cooking our English breakfast to order, which included eggs, sausage, bacon, grilled tomatoes, black pudding and toast. Over breakfast, we chatted with fellow travelers and compared notes on all of the many things to see and do in the Cotswold region. Steve gave us expert recommendations for our day – all of the local sites, nearby villages, gardens and manor homes to see. Equipped with maps and lots of good advice, off we went, still driving on the left, but Blimey now sharing the road with hikers and bicycles! 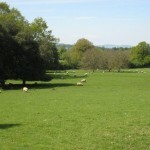 Hiking between the Cotswold villages is a popular activity – it’s called “hiking the Cotswold Way”. As we center all of our concentration on driving on the left, we begin to think that those who are hiking may have the better idea! SEE, SHOP, STOP AT A PUB! 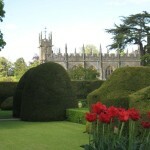 The many fine manor houses and churches throughout the area echo back to centuries ago when the Cotswolds area was made wealthy by the wool trade. The towns were places for buying and selling sheep at market. Today, although the wool business is not as thriving as it once was, these little hamlets have retained their whimsy and people still love to visit. 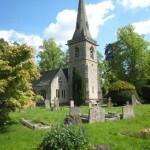 We moseyed through the picturesque villages of Broadway, Lower Slaughter with its lovely country stone church and fascinating graveyard, and Bourton on the Water, with its tea shops and little water canals everywhere. At Stow on the Wold, we lunched at our favorite pub ever, the Queens Head Inn. This place is everything you imagine an English country pub to be – stone walls, weathered wooden booths, a smoke-smudged hearth and all kinds of funky artifacts hanging on the walls. 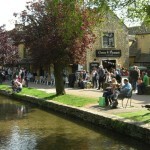 Here the locals bring their dogs with them – mostly English Spaniels or hound dogs – they sit contentedly as their masters enjoy a pint or have lunch. We ordered Pea Soup with Mint – now that is something you certainly don’t always see on a menu in the U.S.! 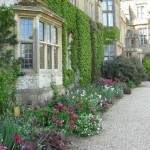 We devoted the next day to visiting the famous Hidcote Gardens just up the road from Staddlestones, where we wandered pathways laden with flowers, discovered secret gardens and admired panoramic vistas. A little further down the road brought us to Snowshill Manor which houses fascinating treasures from around the world, and had spacious hillside gardens where lots of local families in shorts and sandals were reclining in the grass and picnicking on the first day of spring. “Just lovely” as they would say! The highlight of the day was a visit to Sudeley Castle, a 15th century castle probably best known as the home and burial place of Katherine Parr, Henry VIII’s last wife. The palace has a rich history tied to the monarchy and Alice in Wonderland-like yew and rose gardens. On our last night at Staddlestones, I sat journaling in our comfy bed. The only sound I could hear was the sheep baa-ing outside my window. To this City Girl, the hushed beauty and serenity of the Cotswolds is captivating. The next time my heart rate starts to rise while driving on the left, I will remember this enchanting place. Indeed, it is simply lovely!